The Ecological Angler - Steelhead and Coho Habitat of Waddell Creek. Waddell Creek is located in central California, approximately two-thirds of the way from San Francisco to Monterey Bay. It enters the Pacific Ocean approximately 17 air-line miles and 20 miles by coast northwest of the northern end of Monterey Bay and three air-line miles southwest of Año Nuevo Point, on the coast of Santa Cruz County. The area borders the southern edge of the humid (read: foggy) coast belt. 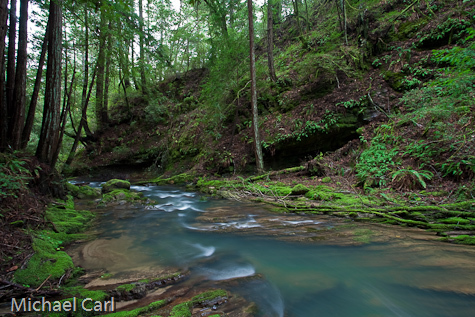 The headwaters of most of the streams in this belt are subject to a lot of rain during the winter months. The Waddell Creek watershed has a mean annual rainfall of between 55 and 60 inches. The lower portion of the watershed receives much less rainfall, averaging in the neighborhood of 30 inches near the coast. More than one-half of the rain falls during December, January, and February. Because of the distinct wet and dry seasons, there are tremendous fluctuations in the flow of most of the coastal streams. During a portion of the year, which may be spring or summer or both, dense fogs roll in from the ocean and blanket the lower portion of the stream. These cool the water and even temporarily increase the flow to a slight extent. 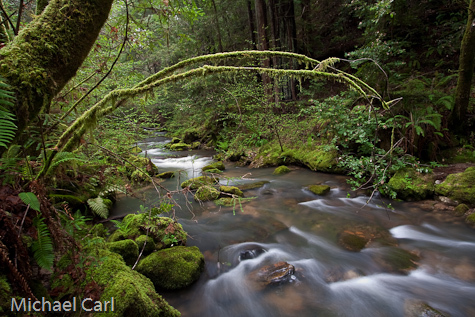 Like nearly all California coastal streams, small or large, Waddell Creek terminates in a drowned mouth or lagoon, which is subject to tidal action during those portions of the year when it is not closed by a sand bar. 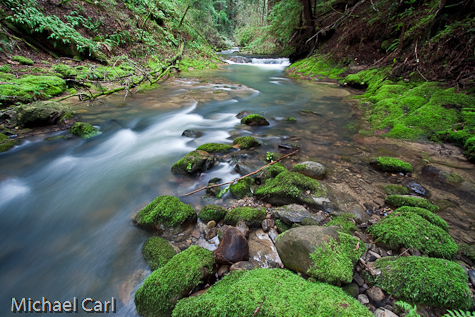 Waddell Creek has its source in the Redwood belt of the Santa Cruz Mountains, at an altitude of 1,500 to 2,300 feet, in the form of half a dozen or so small tributary streams located in the California Redwood State Park (Big Basin). These small tributaries unite to form two larger streams, the East Branch and the West Branch, which in turn join to form the main branch of Waddell Creek. The length from mouth to source is approximately 12 miles. The hydrographic basin of Waddell Creek has an area of 26 square miles. The distance from the uppermost limit of tidewater to the junction of the East Branch with the West Branch (called "The Forks") is 14,500 feet. The distance from The Forks (elevation about 90 feet) to Slippery Falls (elevation about 185 feet) on the West Branch, usually the uppermost limit to which upstream migrants can ascend on the West Branch, is 14,000 feet. The distance from The Forks to the Main Falls on the East Branch (elevation about 210 feet), the uppermost limit to which upstream migrants can ascend the East Branch, is almost exactly one mile. The lower portion of the West Branch (from Henry Creek to The Forks) and the main stream (below The Forks) are broader and contain fewer deep pools. Here there are abundant gravel and small rubble beds, interspersed with stretches of sandy bottom or coarse rubble. The stream banks are lined by Red Alder (Alnus rubra), Big-leaf Maple (Acer macrophyllum), Buckeye (Aesculus californica), Madrono (Arbutus menziesii), California Laurel (Umbellularia californica), and, in the lowermost portion, by willows (Salix spp.). Also encountered occasionally are Tan Oak (Lithocarpus densiflora), Box Elder (Acer negundo), White Alder (Alnus rhombifolia), Black Cottonwood (Populus trichocarpa), California Nutmeg (Torreya californica), Redwood, and Douglas Fir. The redwoods extend to within about a mile of the coast at this point and the lowermost portion of the stream flows through the Upper Sonoran Life Zone. Here several patches of cultivated grassland and crop fields are scattered through a valley, which is about 2,000 feet wide at its broadest point and extends inland about 6,000 feet. The hill-slopes are populated mostly by chaparral, pines, and Douglas fir. The predominant sandstone formation is covered with a loose, whitish, diatomaceous shale. The most significant changes from the primitive condition of the area have taken place as a result of human usage. The redwood forest of the watershed below Big Basin was logged off by 1870 and is now covered by a second growth.